A-60 C, 1st Floor, Sector 63 Noida - 201301, U.P. 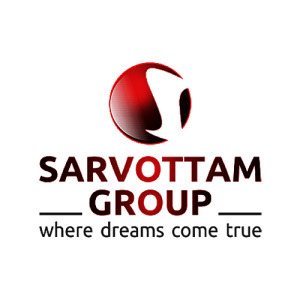 Sarvottam Group is one of the most well known names in the real estate industry in India. Sarvottam Group is the love child of KSN Developers and Shalviya Infra, two of the most respected names in the real estate industry in India. Their vision is to continuously excel to achieve and maintain leadership position in the chosen businesses and delight all stakeholders by making economic value additions in all corporate functions. Their mission is to provide affordable real estate solutions to its valued customers. Sarvottam Group has various commercial and residential projects spread across Delhi NCR. Since 2005 the KSN Group has carved a significant niche for itself in the real estate industry. Some of their most celebrated projects include Sarvottam NX1 and Sarvottam Shree. These projects have had excellent turnovers and are known for their wide list of features and amenities. The Sarvottam Group is known for keeping in mind international standards while conceptualizing and building any project. These projects are also known for the great location advantages they offer. With teams of experts and years of combined experience under their belt, Sarvottam Group has carved a niche for itself and is one of the most respected and trusted names in the real estate sector in India today.